I decided to spend my spring doing very low-key birding activities and decompressing after all the medical drama of the past few months. I’m leading informal warbler walks every Tuesday and Thursday, unless it’s raining, but otherwise my time is my own for the first spring in many years. 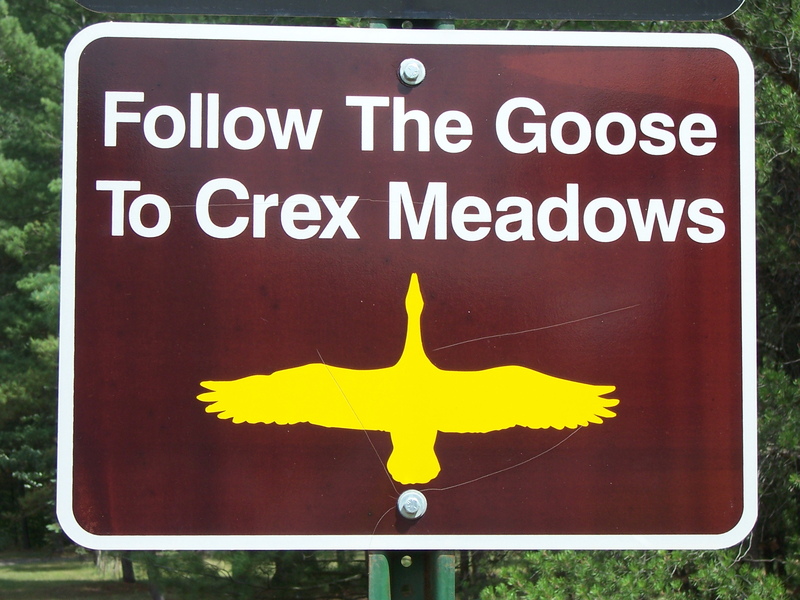 I decided to spend Earth Day at Crex Meadows Wildlife Area, in Grantsburg, Wisconsin. I’ve birded there several times over the years on my own, but never had the leisure to explore it. 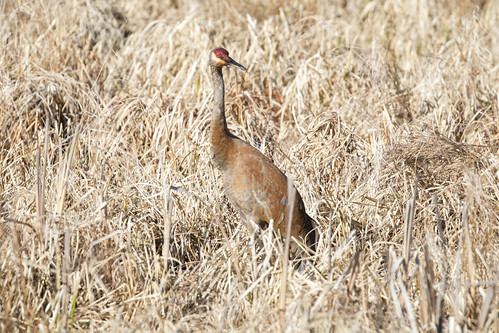 So when I received an email about their spring events, I signed up for two birding field trips so I could go out with experienced birders who know the place way better than I do. The first of these was on Earth Day. It was lovely being outdoors on a beautiful morning, and I relished being a participant rather than a leader for a birding event. The eleven of us drove around Phantom Lake and to some other spots in our 2-hour field trip. 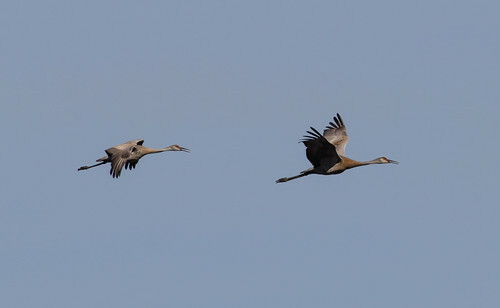 I love early migration, when we’re seeing late winter stragglers and the very first of the spring arrivals. And Saturday fit the bill. We saw a surprising number of lingering American Tree Sparrows even as I saw and heard my first Chipping Sparrows of the year. We were in that weird middle-area as far as water birds go: many of the ducks people had seen in the past week had moved on, but our only shorebirds were a single fly-by Killdeer and two Lesser Yellowlegs. Yellow-rumps and Ruby-crowned Kinglets abounded, but no other warblers had arrived yet. 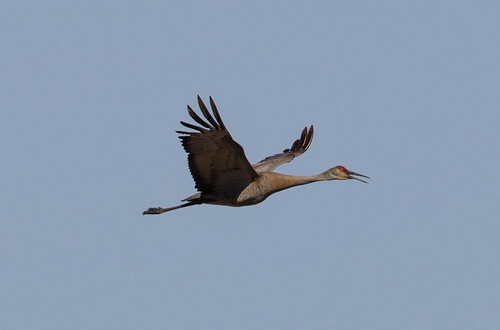 Many of the early nesting birds were wonderfully cooperative, especially Trumpeter Swans, Bald Eagles, Red-necked Grebes, and Sandhill Cranes. After the field trip, I went by myself back to Phantom Lake to get more photos. 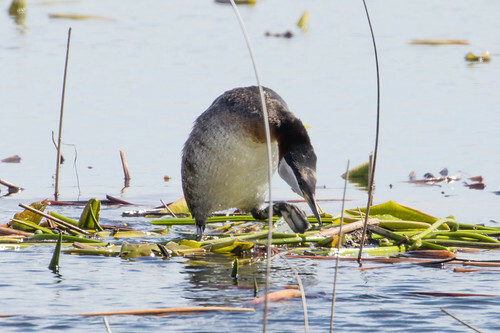 I had an especially lovely time watching a Red-necked Grebe pair that was fairly close to the road. They seem to be working on a nest. Unfortunately, the brilliant sun that felt so very good was pretty strong on the birds. 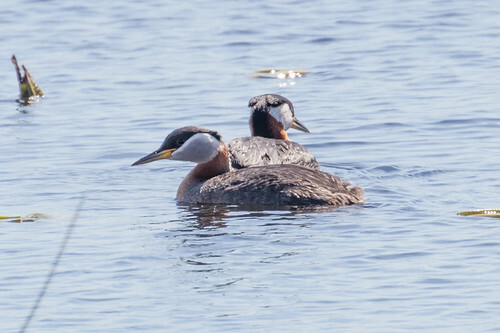 I got my best photos ever of Red-necked Grebes, but they were hardly great. I’ll have to go back there in mid- to late-afternoon when the sun is lower and behind me to get better ones. 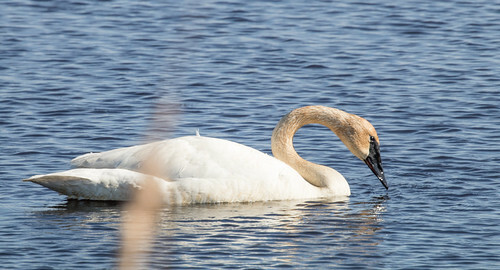 I did get some nice shots and video of Trumpeter Swans feeding. It’s gratifying beyond measure to see such tangible, beautiful proof that the Endangered Species Act really works—Trumpeter Swans had been wiped out of their entire former range except a tiny pocket in Montana and Canada until research and reintroduction projects under the Endangered Species Act brought this splendid bird back. I came home pretty exhausted—it’s interesting how even though I feel great, I’m get tired more easily nowadays. But it was a lovely exhaustion. I had told one of the groups that we were going to make it to a certain wood line, and when we reached it we would turn around and come back. There was a director in that group who let me know that she wouldn’t be able to make it all the way to the wood line because of a meeting she had. She discovered what many of us have discovered. Spending time in nature is very much…life giving. Watching a Bald Eagle feed young is...life giving. Watching a Blue-gray Gnatcatcher build a nest is...life giving. Those things will help you put life in perspective. "Behold the birds of the air..."